Ti–6Al–4 V is classed as difficult-to-process material due to its lower thermal conductivity and specific heat. Furthermore, the contact area between grinding wheel and workpiece is larger than other processing methods generally. Therefore, the process of grinding Ti–6Al–4 V is easier to generate high temperature. Most grinding fluid are used and wasted in usual grinding process to dissipate heat. Some green technologies are used to solve this issue in the aspect of fluid supply usually. This paper is to reduce grinding temperature from the other way–grinding wheel. In order to lower grinding temperature without increasing liquid coolant flow, an innovative grinding wheel inspired by phyllotaxis theory was manufactured using electroplating method and photo etching technique. Some contrastive experiments of grinding temperature for the alloy were conducted with the measured method of artificial thermocouple. The change rule of grinding temperature with the change of grinding parameters was found. The results shown that the grinding temperature of Ti–6Al–4 V with the biomimetic engineered grinding wheel was always the lowest in experiments due to less heat generation and more heat dissipation. Finally, the grinding temperature of the biomimetic engineered grinding wheels with different phyllotactic coefficient were investigated and discussed. 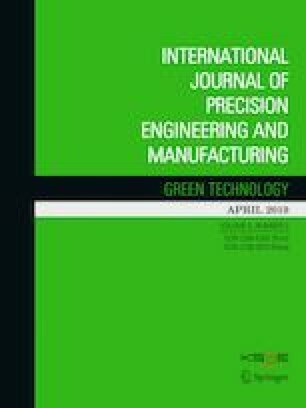 A new point of view to lower grinding temperature was present and proved in this paper, which may become an important green technology for grinding in future. The authors gratefully acknowledge the support for this work from National Natural Science Foundation of China (Grant no. 51175352), Jilin education department “13th five-year” science and technology project (Grant no. JJKH20191301KJ).